Big News! ESA Allstars Stars Shine at The 2018 ECSHOF Induction At Surf Expo | EasternSurf.com | All East Coast. All The Time. 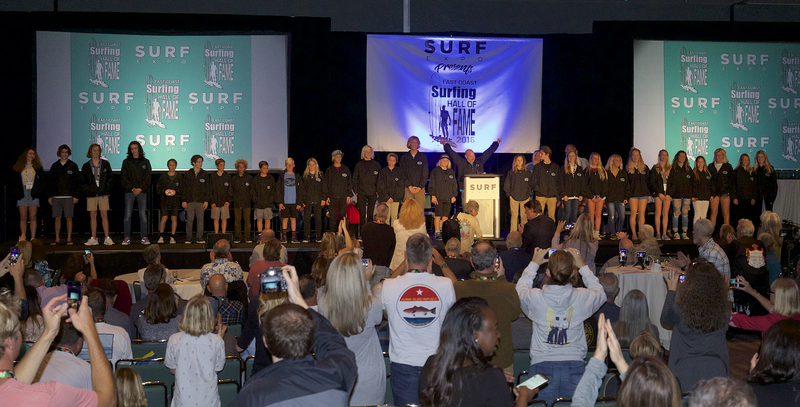 In a highlight moment during a fantastic evening honoring 11 East Coast legends at this year’s biannual East Coast Surfing Hall of Fame Induction Ceremony, the Eastern Surfing Association officially presented to the public the 2018 iteration of their stacked Allstar Team, as well as their new head coach – and one of the organization’s winningest competitors ever – Jason Motes. It was a perfect pairing to see the pride of young cubs sharing the same stage teeming with former ESA standouts, many of whom made it into the ECSHOF circle of honor based in some measure on their ESA achievements over the years. To see the Old Lions’ exuberance in applauding the next generation of young hopefuls was not only inspiring, but also begged the question of just how many of this bright, young bunch will one day occupy the seats directly behind them to receive this ultimate East Coast accolade themselves. It has been one hell of a fun, jam-packed two-week stretch for East Coast surfing with the running of the WSL Women’s QS6,000, the WSL Men’s QS1,500 and the Icons and Champions specialty event at Sebastian Inlet, the induction of the ECSHOF’s Class of 2018, three days of Surf Expo, and the ESA Allstar Team’s reveal. And ESM will be covering it all in full — including mega photo galleries — in the week ahead, right here at www.easternsurf.com, your One True Voice Of East Coast Surfing, 24-7/365.